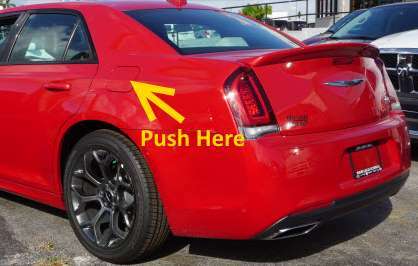 Wondering how to open the gas tank door on any 2010 through 2018 Chrysler 200 and 300 model vehicles? We’ve got you covered with this tutorial. There is actually no release button or lever for the gas tank door on the inside of the vehicle. Simply locate the fuel door at the rear of the vehicle, then press it inward. The door will pop open, allowing you access to the gas cap. Don’t feel bad if you couldn’t figure this out on your own. Many folks who rent this vehicle have been confused on how to open the door as well. Got out of a long line at the gas pump because i didn’t know how to release cover. There was no thoughts for safety to the consumer when this car was designed.